The California Smokers’ Helpline and its training and technical assistance arm, the Center for Tobacco Cessation, are pleased to provide a free Provider Toolkit, Help Patients Quit with e-Referral to the California Smokers' Helpline. 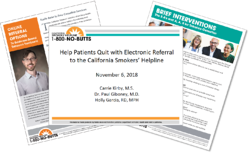 Webinar recording and slide deck: Help Patients Quit with e-Referral to the California Smokers' Helpline. The recorded webinar provides an overview of Helpline electronic referral (e-referral) options and best practices for implementation in outpatient settings from the Los Angeles County Department of Health Services (LADHS) and from Alameda Health Systems. Paul Giboney, MD, Associate Chief Medical Officer for Los Angeles County Department of Health Services (LADHS), describes the use of the LADHS eConsult program to refer patients to the Helpline from over 4,500 health care providers throughout Los Angeles County. Holly Garcia, RD, MPH, Director of Ambulatory Innovation and Experience for Alameda Health Systems, discusses the use of DIRECT referral to the Helpline from outpatient clinics affiliated with Alameda Health Systems. Carrie Kirby, MA, Project Manager, describes the e-referral options available from the California Smokers' Helpline. Just complete the form to download the materials now!